I love my Cornish pasty recipes. (What is pass-tee?) 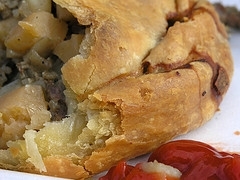 It's a savory crust filled with sliced or cubed potatoes and steak or hamburger. Some folks add rutabagas or carrots too. Here in Wisconsin, it is often served with Indian sauce (a thicker chili sauce), ketchup or gravy. There are so many pasty recipes floating around, but I am giving you recipes that I love. If you do not use the rutabaga, just add another cup of cubed potatoes. Makes 3 pasties. You may also use your favorite pie crust - just omit the sugar or sweetener to it. To make the crust, cut the cold lard (shortening if you don't have it) into the dry ingredients until the mixture are the size of small peas. Mix the cold water in with the beaten egg. Form a well in the dry ingredients and add the egg mixture. Blend into the dry ingredients until the dough holds together. Shape into a ball and divide into 3 equal parts. Wrap in Saran Wrap and place in the refrigerator for 30 minutes. Bake for 10 minutes. Lower heat to 325 degrees and bake for 1-1/4 to 1-1/2 hours. Remove from oven and cover with a thin towel until ready to serve. Chop the tomatoes, apples and onions. Add the remaining ingredients. You may need to skim off some liquid after cooking for two hours; or until mixture is thick. Place in pint jars with lids. You may use a pressure cooker or hot water bath to seal. Sift the flour and cut in the cold shortening until the pieces are the size of small peas. Add the cold water a tablespoon at a time, and mix quickly with a fork until dough forms. Divide in half and wrap in saran wrap; chill for 30 minutes. Cut shortening into dry ingredients until it's like coarse meal. Mix water and vinegar with beaten egg; blend into dry coarse meal until it holds together. Shape into a ball and divide into 3 parts. Roll each ball to a 8 or 9 inch circle and place on a baking sheet. Mix filling ingredients and divide into 3 parts. Place on half of the pastry circle. Fold the other half over the top and seal edges together by moistening with cold water, then pressing together and crimping with fingers. Cut a small slit in the top of each pasty. Bake 60 to 75 minutes. Remove from the oven and cover with a towel until ready to serve. My grandpa would spoon a tablespoon of cream into the slit as soon as it came out of the oven. Yes, I am Cornish. Combine onions and ham. Mix all other ingredients; add onions and ham. Pour into the unbaked pie crust and top with remaining crust. Crimp and bake one hour. Cube beef roast and roll pieces in flour. Place in a large heavy skillet (cast iron) with a teaspoon of heated oil and brown cubes well. Add onions and water. Place cast iron skillet in oven and cook until almost tender. Add bouillon cubes at any time, for added salt and flavor. Meanwhile, make the dumplings. Mix the flour, baking powder and sugar together in a bowl with a whisk. Cut in cold butter until crumbly. Add milk to make a soft dough. Bring half a pot of water to a boil and drop by spoonfuls into boiling water (works with soup or stew also). Cover and cook for 15 minutes; no peeking. When pie is ready add the cooked dumplings over the top of the pie and bake for 10 minutes at 400 degrees to brown slightly. If you like you may add 1 tablespoon of dried parsley to the dumplings. Serve with cabbage salad, baked beans, corn and Indian or Chili sauce. This recipe is at least 100 years old (if not more) by Marion Linden. I miss you Deet. PREHEAT oven to 325 degrees. Grease and flour two loaf pans; set aside. Place raisins in a bowl of warm water for 10 minutes. Sift the flour, baking powder and salt together; set aside. Steep saffron in 2 to 3 tablespoons of hot water for 5 minutes. Meanwhile, cream the shortening and sugar together until light and fluffy. Add the lemon extract and saffron; mix well. Now add the eggs, one at a time, mixing well after each addition. Add dry ingredients, one cup at a time, alternately with the milk. 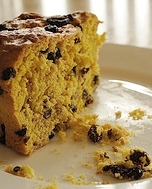 Fold in the plump raisins. Bake in a slow oven for 1-1/4 to 1-1/2 hours. Insert a spaghetti noodle into the center of the cake and if it comes out clean, the loaf is done. Let sit to cool and cut into slices. Make a pot of coffee and spread each slice with butter. I have more than a Cornish pasty recipe, check out more dinner ideas below.